* Sixth District- Atlanta– “Agriculture conditions across the District were mixed. Significant rain improved drought conditions in Alabama, Florida, and Georgia; however, there were abnormally dry conditions reported mostly in Louisiana and to a lesser degree in Mississippi and Tennessee. There were also some areas that experienced above-normal temperatures and locally heavy rains, resulting in some crop stress. * Seventh District- Chicago– “The outlook for agriculture income dimmed some over the reporting period as prices for most commodities fell. Crop farmers reported that in general, field conditions were excellent and better than last year. “Both corn and soybean prices fell, reducing expected profits from the upcoming harvest. Mark Ash and Mariana Matias, Oil Crops Outlook, OCS-18g, U.S. Department of Agriculture, Economic Research Service, July 16, 2018. Livestock farmers continued to struggle overall, with some reports of asset sales by hog producers and closures of dairy operations. Contacts throughout the District expressed heightened concerns about the impact of trade disputes and tariffs on the agricultural industry. * Eighth District- St. Louis– “Agriculture conditions weakened slightly from the previous reporting period, but improved slightly from the same time last year. The percentages of corn, cotton, and rice rated fair or better in June declined slightly relative to the prior month, while that of soybeansincreased modestly. 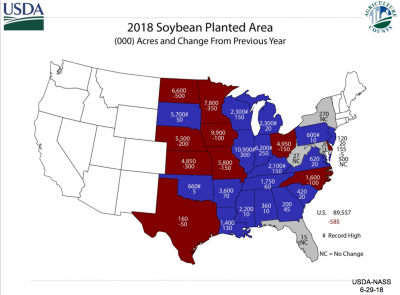 However, both the corn and soybeans percentages were higher than a year ago, the cotton percentage was little changed, and the rice percentage was down slightly. Estimated soybean acreage saw a substantial upward adjustment in Illinois relative to March planting intentions but was revised downward in Missouri. Acreage, Grain Stocks-Rice Stocks Executive Summary. Lance Honig, Chief Crops Branch USDA- National Agricultural Statistics Service (June 29, 2018). * Tenth District- Kansas City– “The Tenth District farm economy weakened slightly, and drought persisted in some regions. Trade uncertainty and expectations of larger supplies in 2018 put downward pressure on crop prices. * Eleventh District- Dallas– “Drought conditions became slightly less severe but more widespread over the reporting period. Texas farmers were concerned because the drought will likely suppress crop yields, and crop prices are lower due to trade restrictions and strong U.S. production prospects.